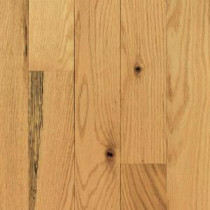 Buy online Red Oak Natural 3/8 in. Thick x 5 in. Wide x Random Length Engineered Hardwood Flooring (24.5 sq. ft. / case) 20485 and leave review or share with Your friends. Blue Ridge Red Oak Natural 3/8 in. Engineered Hardwood Flooring is sealed with an aluminum oxide finish, providing protection from every day wear. This product carries a 30-year finish warranty and has a Janka hardness rating of 1152. Each plank features a micro-beveled edge and square end that enhances the beauty found within each plank. The natural tones present in this flooring are sure to complement the design scheme in any home. 24.5 sq. ft. per case and case weight: 36 lb.